“Heavy rain and wild winds are not what you want while packing up the tent and heading home on our roads,” comments Meteorologist Lisa Murray, “so many people will be happy to hear we are expecting settled weekend weather.” “The reason for this is the southwest flow persisting over the country, but this does bring cooler temperatures for the last few nights of camping,” added Murray. 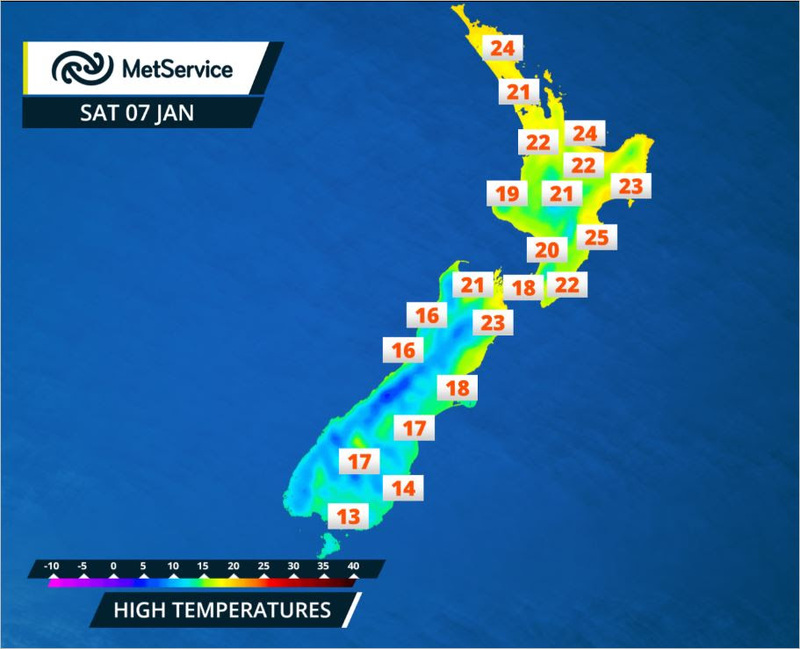 Saturday morning starts with a few early morning showers over the lower part of the North Island, but these clear away in the morning as the front moves north, with fine spells increasing. Mostly fine for the top half of the Island, but areas of cloud and isolated showers are expected to develop over inland areas during the evening. The South Island starts with a few showers about the south coast but these move up the east coast during the day, reaching north Canterbury at night. On Sunday the southwest winds continue with cloud and a few showers affecting western areas especially for the South Island. Eastern areas should remain dry apart from a few showers south of Oamaru. Forecast maximum temperatures for Saturday. “When heading on a road trip there are two websites I always check,” advises Ms. Murray, “MetService for weather and NZTA for information on the road works, road closures and traffic”. This entry was posted on	January 6, 2017 at 4:03 pm	and is filed under Press Release.